The 4th September 2014 the A/W14 H&M Studio collection will be launched in selected stores. The collection has a bohemian touch and is perfect for the modern and confident woman, that wants to stand out with masculine cuts and effortless, oversized pieces without losing her female charms. This jacket reminds us very much of a Vintage wool Jacket we own, we love the oversized loose cut and the colour is beautiful, the jacket can be combined in various ways. We would combine it for example with skinny jeans, and leather boots. 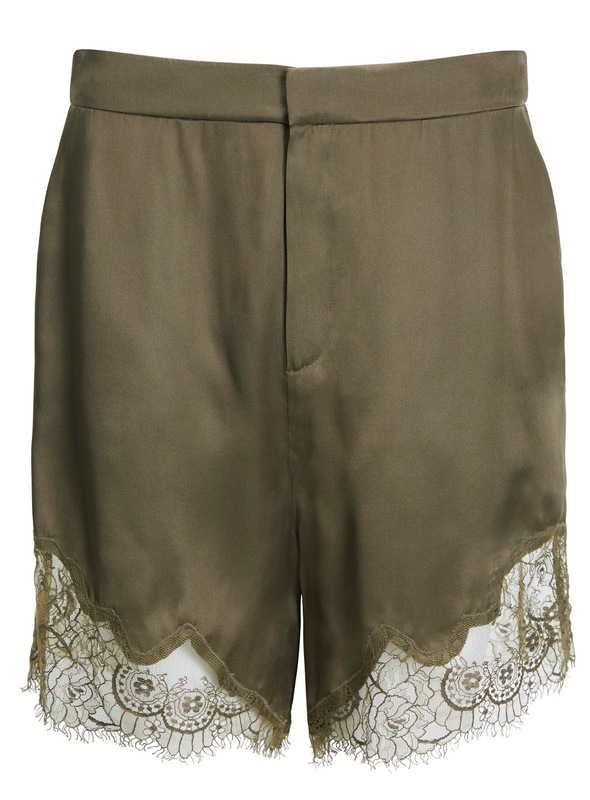 What we like best about these shorts is the lace at the bottom, it gives the shorts a very elegant and playful look. We think the olive colour is perfect for fall fashion and we would combine the pants with a beige blouse (or a crop top for the warmer days) and tights. 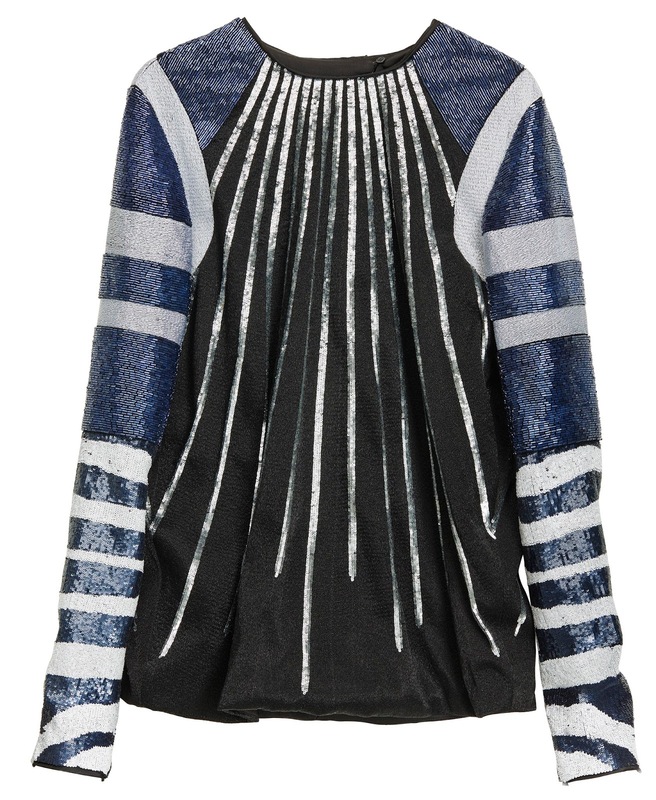 With this top you don't need to wear jewelry, or just keep it very simple, because with the different materials and the pattern it is an absolute eye-catcher and shines best for itself. We would combine it with a black high waisted skinny jean and pumps. These leggings are simple but still very fashionable and we like the geometric detail on the upper leg. 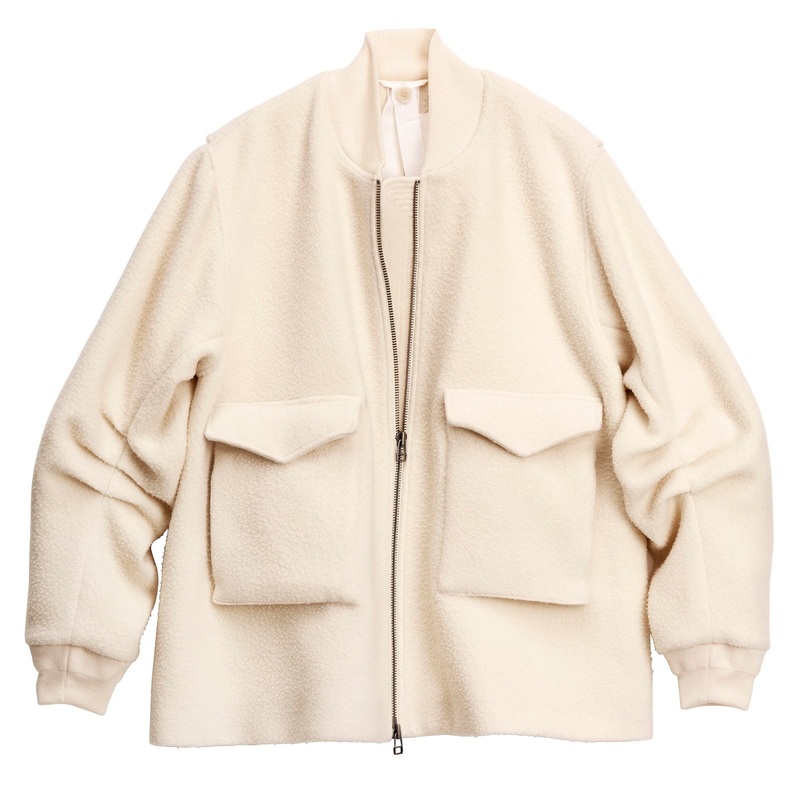 We would combine it with a simple oversized top, chunky jewelry and your favourite sneakers. 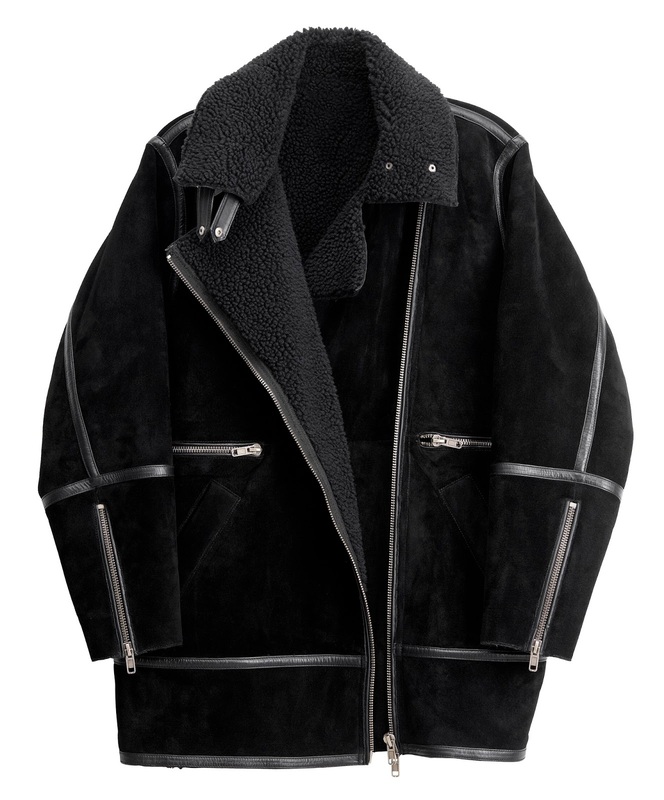 This jacket is one of our favourite pieces of the H&M Studio Collection, the aviator style and the masculine cut is very stylish and we love the combination of leather and wool. We can imagine this jacket to be worn both by men and women and look fashionable for every occasion. For more inspiration and the complete collection watch the Look Book Film and visit the official website. Pharrell Williams - GIRL - Win a Vinyl! "Happy", the hit single from the album GIRL by Pharrell, made the whole world dance and feel good this summer. We like the album very much, and beside happy there are other fantastic songs on it! Our three favourites are Marilyn Monroe, Hunter and Lost Queen. Starting his Dear Girl Tour in Manchester on September 7, 2014 with the last show in Hamilton, December 21, 2014, Pharrell Williams will be in Zurich, Switzerland September 21, 2014. Until then, to put you into the right mood for the concert, we have one brand new vinyl album GIRL from Pharrell Williams for you! All you have to do to be the lucky winner, is post the link to our blog on your favourite social media platform, and send us an email with your full name and adress. We will draw the happy winner August 22, 2014 and if it's you, you will recieve an email that day! Good luck and till then, stay HAPPY! Tomorrow, August 15 2014 the H&M HOME in Basel opens its doors. Interior decoration for us is a big part of ones personality, and H&M HOME gives you the possibility to buy beautiful decorations, candles, bath accessoires, blankets and much more at an affordable price. We have already shopped at H&M HOME Stores in Paris and in London before and we have always found something we liked and that was the perfect addition to what we already own. As a foretaste, tonight was a H&M HOME Before Party in Basel, of course the whole place was decorated with beautiful things such as candles, blankets, napkins and much more from H&M HOME. Also there were 4 artists, who were working on a artpiece with the subject "home". Tonight was the perfect inspiration to put you in the mood to go shopping at H&M HOME. We all know the classic Converse Chuck Taylor All Star shoe, that is worn by people with all different kinds of styles. The Shoes are very adaptable and the more you wear them, the better they look, as they get a unique, used touch and a history. With the latest of 8 Missoni Collaborations since 2010, Converse has now shown once again that they can keep up with the times and have an impeccable sense for fashion and what is wanted these days. The signature Missoni zig zag is irresistible and the choice of colour is perfect, so you will surely find a colour you like. We really like the aztec pattern because it is a highlight to every outfit and it can be combined almost endlessly. The shoes are available since August 4 exclusively at Nordstrom and the complete collection will be available at Converse stores and online on August 28, 2014. The Rose Day Cream is a classic from the Dr. Hauschka skin care products and one of the most popular. Since this June it is available with an improved and even more precious composition. It now contains rose water, essential oil from Damask roses, extracts of wild rose hips, rose blossoms and rose wax and combines the strength, beauty and smoothness of the rose in one amazing face cream. The Rose Day Cream is perfect for normal, dry and sensitive skin. We have been using it for a while now and absolutely love it. The texture is incredibly smooth and nourishing and leaves the skin soft and radiant. The Cream feels like a protective layer without being heavy on the skin. The odour is very soft and has a calming and harmonizing effect that lasts the whole day without being too intense. That way also a man can use it without being "perfumed". What we also like very much is the packaging of the Rose Day Cream, as a metaphor for the cream itself, the packaging is very creative and reveals its true beauty only on the inside. Dr. Hauschka is a brand that creates natural and conscious cosmetics and skin care products that leave the skin nourished, healthy and beautiful.